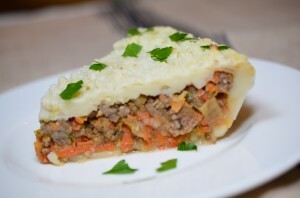 Shepherd’s Pie made from fresh ingredients is an easy, light textured, full flavored dish. Serve with a simple salad, or roasted vegetables for a complete meal. Traditionally made with ground lamb, this recipe uses ground chuck roast. Ask the meat department to grind for you. If they ask what consistency you would like, ask for coarse grind which is chunkier than hamburger. If you don’t want to grind your own by pulsing chunks of roast in your food processor, simply use ground beef. The only reason I suggest grinding the meat is that each strand of muscle in meat is like a straw. When freshly ground, those ends are open and receptive to drawing up flavorings into the center of each bit. When you use pre-ground beef, those ends have dried up and drawn together preventing that sort of flavor uptake. Don’t get me wrong, using ground beef will be tasty, but just not as flavorful as using freshly ground meat. Whew, enough of that. Restaurants have given shepherd’s pie a bad reputation because it is the go to savory recipe for using up leftovers; mashed potatoes, roast, and brown gravy. Blah. Usually heavy and not well seasoned, it is easy to see why many people avoid it. What a revelation when made with fresh mashed potatoes, and easily made brown gravy, and freshly ground meat. It is filling, yes, but not heavy. It smells heavenly, and the aroma will draw the family to the table before you even think of it! Colorful vegetables accent the light yet filling slice. Peel potatoes, cube, and place in a large pot filled with cold water to cover the potatoes. Bring to a boil over medium high heat. Cook until potatoes are soft, about 25-30 minutes. If you don’t have a large enough pot, just divide potatoes between two smaller pots and proceed. Drain water from potatoes, and mash while hot. It’s okay if a few lumps remain. Season with salt. Set aside. While potatoes are cooking, make the brown gravy by whisking together oil and flour in a large skillet over medium high heat. Whisk mixture constantly until it reaches the color of peanut butter and smells toasted, about 15 minutes. This is called a medium dark roux. Pour in a cup of stock and whisk furiously. Pour in another cup, and whisk until smooth. Pour in the last cup, and whisk until smooth. Stir in salt and pepper to taste. Bring to a simmer and allow to cook for 5 minutes. Remove from heat until ready to use in filling. Preheat oven to 400 degrees. For the filling, heat the vegetable oil in a large heavy saute pan or skillet until it shimmers. Add beef, and break up pieces. Cook until no longer pink, about 7 minutes.. Stir in 1-1/2 cups of brown gravy. Keep remainder of gravy warm to serve on the side. Stir in carrots, and onions. Cook until onions are translucent, about 5 minutes. Stir in worcestershire sauce, tomato paste, parsley, thyme, pepper, and salt. Using whatever dish you decide upon, spoon a generous amount of mashed potatoes into dish(es). Using a rubber spatula, spread potatoes over the bottom and up the sides of the dish making about 1/4” thickness of potatoes. Spoon in the filling. Plop remaining potatoes over top of filling. Gently spread out to edges of dish. Run a large serving fork through the mashed potatoes to create a roughened texture. Bake in the oven to set the pie and brown the top, about 20 minutes. Serve hot with the remaining gravy on the side. NOTE: I bought a chuck roast and cut it into big chunks then pulsed in food processor until coarsely ground. Freshly ground meat absorbs the flavors of the other ingredients a hundred times better than pre-ground meat! If you can’t grind the meat yourself, ask the meat department (Sam’s Club is always willing to do this) to grind the roast for you. Chuck or rump roast makes flavorful ground beef for this.